***You can purchase an INEXPENSIVE AD-FREE PDF of this pattern on Etsy HERE and on LoveKnitting HERE! This beautifully formatted PDF includes the step-by-step pictures and the patterns for BOTH the Cotton Candy Cowl & Cotton Candy Beanie. The PDF is a total of 5 pages including the cover page! These patterns can also be found in my Easy & Modern Knits Pattern Bundle found HERE (includes over a dozen of my knit patterns at a discounted price)! Furthermore, Lion Brand Yarn has put together a convenient kit HERE that contains all the yarn you need to make both the cowl and beanie along with the patterns! I have used Wool-Ease Thick & Quick Yarn in many of my crochet and knit designs as it is such a versatile yarn that comes in a wide range of colours. It is a super bulky (level 6) yarn, and its 80% acrylic/20% wool composition means that it is warm and also easy to care for. Most of my designs have used fairly neutral colourways, but I fell in love with this stunning “Carousel” colourway as soon as I lay my eyes on it! The blend of pink, mint green, purple and grey are so unique and unlike anything I’ve seen before- Lion Brand Yarn really hit it out of the park when they came up with this colourway! I was so excited to cast on this yarn and see how it would knit up in a beanie! I used my Clover Takumi 9 mm needles to work the ribbing and was thrilled to see the beautiful colours building up. For the body of the beanie, I switched to 10 mm needles and worked the seed stitch. 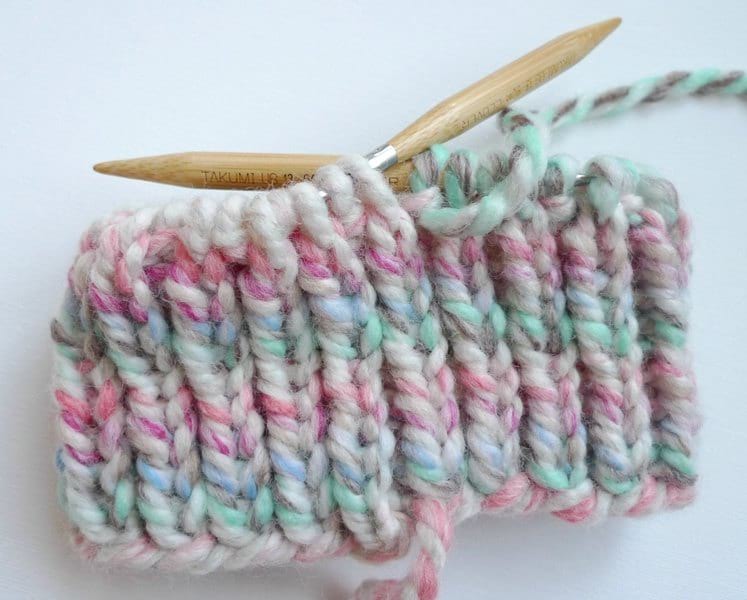 I LOVE the seed stitch as it provides such beautiful texture and is simple to knit. If you need a refresher on how to knit the seed stitch, please reference my “How to Knit the Seed Stitch” step-by-step picture and video tutorial HERE! To work the seed stitch, you alternate knit and purl stitches. On subsequent rounds, you knit all the purl stitches and purl all the knit stitches from the previous round. When it was time to close up the top of the beanie, I threaded the yarn tail through the last remaining stitches and pulled tight. As a finishing touch, I decided to add a yarn pom pom to the top of this beanie! I used the left-over Homespun yarn from my Cotton Candy Cowl (see free pattern HERE) and my large Clover Pom Pom Maker to make this pom pom. 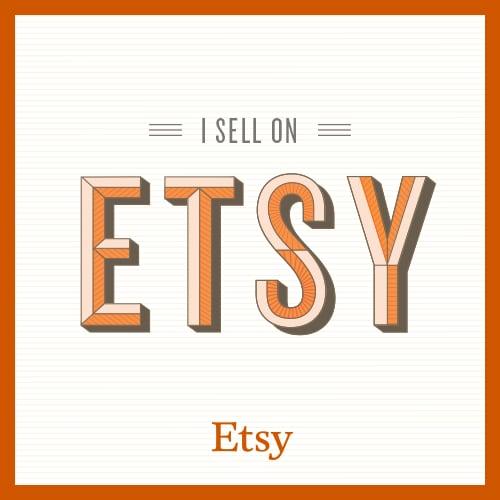 I also added a personalized cork garment tag by Brickbubble as I love adding garment tags to my handmade pieces! Ribbing is worked for the first 10 rounds with an even number of stitches. On the tenth round, we work an increase during the last stitch by purling front and back. This creates an odd number of stitches and sets up the seed stitch pattern. Step 1: With yarn in front, insert the working needle into the next three stitches on the main needle, purl wise. Step 2: Wrap the working yarn around the working needle. Step 3: With the working needle, pull the yarn through all three stitches on the main needle. Add more rounds to the body of the beanie (R13-31) if more slouch is desired. Using 9 mm needles and long tail cast on, cast on 42 stitches. R13-31: Rep Rounds 11 and 12 (end on a R11 repeat). R35: *P1, K1* around. (15 sts). Cut yarn and thread tail through last sts. Pull tight, tie knot, and hide end. 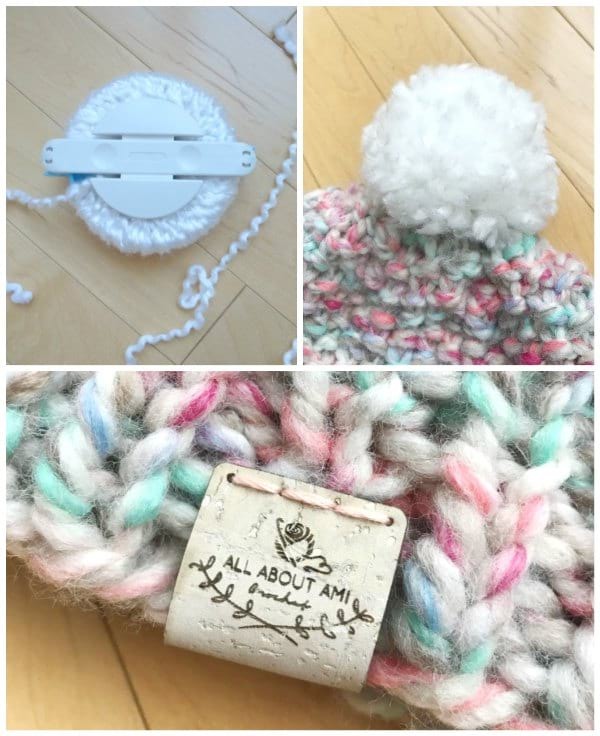 Optional: Make pompom using leftover Homespun yarn from Cotton Candy Cowl with Clover Pom Pom Maker and add to hat. 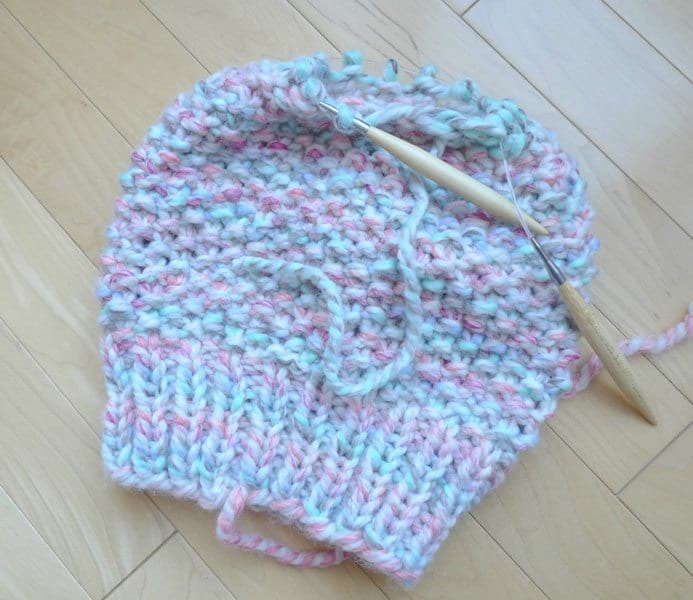 How pretty is this Cotton Candy Beanie? The colours and beautiful texture reminded me of cotton candy, so I thought the name was very fitting! This beanie fits very well and has the perfect amount of slouch! 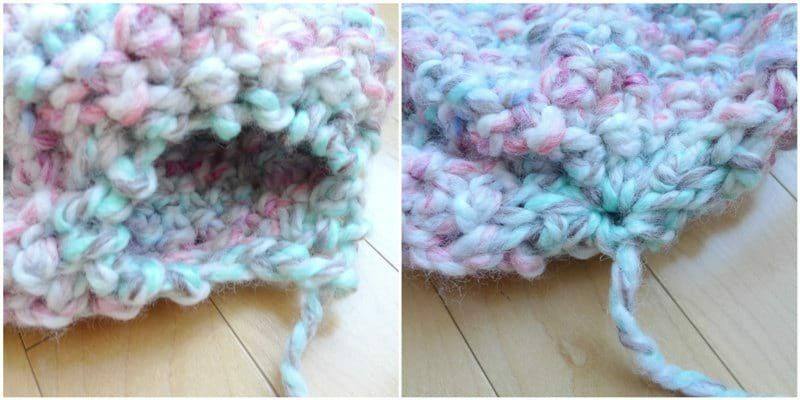 I designed a matching Cotton Candy Cowl to wear with my Cotton Candy Beanie- see the free pattern HERE! Isn’t this set so whimsical and bright? Both the scarf and beanie use the seed stitch, and they really inject some colour and add a touch of whimsy to your winter outfits! Lion Brand Yarn has put together a convenient KIT HERE containing all the yarn you need to make the matching Cotton Candy Cowl & Beanie set! Both pieces are so much fun to knit up as you see the colours change, and quick projects are always so satisfying! I cannot wait to wear my Cotton Candy Beanie & Cowl more this winter! They are so warm and bring such a smile to my face with their bright colours and fun texture. You can find the free pattern for the Cotton Candy Cowl HERE and subscribe to my e-mail newsletter HERE to stay up to date with my work! Happy knitting, everyone!